The irregular motion of a body arising from the thermal motion of the molecules of the material in which the body is immersed. Such a body will of course suffer many collisions with the molecules, which will impart energy and momentum to it. Because, however, there will be fluctuations in the magnitude and direction of the average momentum transferred, the motion of the body will appear irregular and erratic. the disorderly motion of small particles (dimensions of several microns or less) suspended in a liquid or gas; takes place under the influence of collisions of molecules of the surrounding medium. It was discovered by R. Brown in 1827. The suspended particles, visible only under a microscope, move independently of each other and describe complex zigzag trajectories. Brownian movement does not diminish with time and does not depend on the chemical properties of the medium. The intensity of Brownian movement increases with the temperature of the medium and with the reduction of its viscosity and the particle size. A systematic explanation of Brownian movement was given by A. Einstein and M. Smoluchowski in 1905-06 on the basis of kinetic molecular theory. According to this theory, the molecules of a liquid or gas exist in constant thermal movement, and the momenta of various molecules do not have the same magnitude and direction. If the surface of a particle placed in such a medium is small, as is the case for a Brownian particle, then the impacts experienced by the particles—caused by the surrounding molecules—will not be exactly compensated. Consequently, as a result of this “bombardment” by molecules, the Brownian particle falls into disorderly motion, changing the magnitude and direction of its velocity approximately 1014 times per second. In observation of Brownian movement (see Figure 1), the position of a particle is recorded after equal time intervals. Of course, between observations the particle moves non-rectilinearly, but the connection of the successive positions by straight lines yields an arbitrary picture of the motion. Figure 1. Brownian movement of a particle of gamboge in water. The points indicate the successive positions of the particle over 30-second intervals. The observations were performed by J. Perrin under a microscope at a magnification of approximately 3,000.
where k is the Boltzmann constant, T is the absolute temperature, and η is the dynamic viscosity of the medium. The theory of Brownian movement explains the random motion of a particle under the influence of random forces caused by molecules and frictional forces. The random character of the force implies that its action during the time interval τ1 is completely independent of the action during the time interval τ2, unless these intervals overlap. The average force, after a sufficiently large period of time, is equal to zero, and the average displacement Δx of a Brownian particle is also found to be zero. The conclusions of the theory of Brownian movement agree brilliantly with experiments. Formulas (1) and (2) were corroborated by the measurements of J. Perrin and T. Svedberg (1906). On the basis of these relations, the Boltzmann constant and Avogadro’s number were experimentally determined to be in accordance with their values obtained by other methods. The theory of Brownian movement has played an important role in the justification of statistical mechanics; it is of practical significance as well. Above all, Brownian movement limits the accuracy of measuring instruments—for example, the limit of accuracy of the readings of a mirror galvanometer is determined by the chatter of the mirror, which is similar to that of a Brownian particle being bombarded by air molecules; the laws of Brownian movement determine the random movement of electrons, which causes the noise in electric circuits; the dielectric losses in dielectrics are explained by the random motions of the molecule-dipoles that make up the dielectric; and the random motion of ions in solutions of electrolytes increases their electrical resistance. Random movements of small particles suspended in a fluid, caused by the statistical pressure fluctuations over the particle. Xenakis used Brownian movement in many of works of the 1970s, along with other compositional techniques. In this case, the particle is small enough that it undergoes a Brownian movement due to multiple collisions of the very fine particle with the molecules of the fluid stream. Bernard Frize's paintings, at first glance, give the impression of this kind of extreme heterogeneity, but while his work may follow no regular, easily parsed progression, neither is it animated by a kind of Brownian movement that deprives it of all structure. If you just showed it at a student lecture and said, 'This is what Brownian movement looks like through a modern microscope,' nobody would even stop to question the fact. Among Einstein's books are Meaning of Relativity (1923, revised 1945); Investigations on the Theory of the Brownian Movement (1926); About Zionism (1931); On the Method of Theoretical Physics (1933); The World as I See It (1934); and The Evolution of Physics (with Leopold Infeld, 1938). 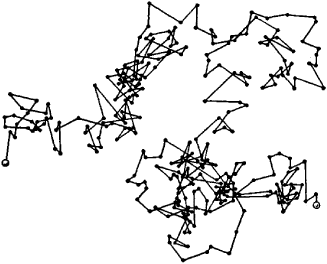 In 1905, Albert Einstein published a pivotal monograph, The Theory of Brownian Movement. That assumption is challenged by the new view of rectified Brownian movement.